Memorial Service Sermon for Robert Drews: "By Grace"
Such a small sentence, yet it is hard to find a greater word which reveals who God is for us. God gives us grace full to the brim in Christ Jesus. 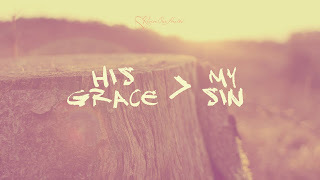 God’s grace is his favor and mercy towards us sinners. It is God’s riches at Christ’s expense. It is free. Undeserved. Unmerited. God’s grace is pure gift, just like the gift of faith. And so these precious words - by grace – also happen to be a fitting description for the life of our dear brother in Christ, Bob Drews. By grace he was Baptized in Dearborn, MI. God’s grace washed him, gave him new birth and life by water and the Word. By grace he grew as a young boy, he learned the Scriptures, Small Catechism, and received our Lord’s body and blood. By grace he married Rita and raised a family in the Lord’s gracious Word and wisdom. By grace he served the fire department for many years, helping and serving others. By grace he walked in the good works that God had prepared beforehand, assisting the board of trustees and elders here at Redeemer, and countless other tasks. By grace he faithfully attended bible study and services here in the Lord’s house, receiving God’s grace by our Lord’s Word and the Lord’s Supper. By grace he grew old. Getting old isn’t for sissies, he would fondly say. Indeed it is not. And so by grace Bob knew that even when he was weak, Christ was his strength. By grace, Bob rests in the promises of Jesus. And so do we. Because God’s grace belongs not only to Bob, but God gives his grace to each of us as well. For St. Paul tells us the truth about our sinful nature. We were dead in trespasses and sin. We did not earn, deserve, or merit God’s love. But that’s why it’s called grace. God made us alive…by grace you are saved. By grace Jesus leads us away from sin and death to life and joy in Him who is the Way. By grace Jesus delivers us who are full of lies and deceit by his Word of promise to for he is the Truth, and his Word is Truth. By grace Jesus conquers our sin and death for he is our Life. By grace you are rescued. By grace you are redeemed. By grace you are saved, just as Bob was. By grace Jesus washes us in the new birth of Holy Baptism. By grace Jesus declares our sins forgiven in Holy Absolution. By grace Jesus feeds us his body and blood in the Holy Supper. For grace is more than a word or a phrase. Grace is not abstract or allegorical. It is more than a feeling or a state of mind. God’s grace has arms and legs to bear you up when you are weak. God’s grace has eyes to look upon us in our need. God’s grace has hands that bore our sin and Bob’s on the cross. God’s grace has a head that was crowned with thorns for us. But God’s grace is not dead. Jesus lives. Grace is a person: Jesus. Yea though we walk through the valley of the shadow of death; we will fear no evil…for Thou art with us. Thy rod and Thy staff…and Thy grace comfort us. God, being rich in mercy, because of the great love with which he loved us, even when we were dead in our trespasses, made us alive together with Christ—by grace you have been saved— and raised us up with him and seated us with him in the heavenly places in Christ Jesus, so that in the coming ages he might show the immeasurable riches of his grace in kindness toward us in Christ Jesus. By God’s Grace Jesus was born for you. By God’s grace Jesus has flesh and blood like you. By Grace Jesus carried your sin, sorrow, and brokenness to the cross. By Grace Jesus died for Bob and for us. By Grace Jesus rose from the dead. By grace Jesus will raise us from the dead too, along with Bob and all the faithful. By grace we’re saved. By grace we live. And yes, God’s grace comes to us even when we grieve and mourn, especially then, when we are weak. By grace we look forward to our eternal home and a joyful reunion in heaven with all the saints who are there by grace. By grace we boast in the Lord, as Bob did. Therefore, let not your hearts be troubled. Rejoice in God’s gift of grace in Jesus. Oh yea, some beer, crab legs, and Tillamook chocolate peanut butter ice cream, a few toys, some candy, and a kitty cat. No. No. No. What do you need? Needs and wants. As children we learn the difference. As adults we’re probably still learning. There are wants and needs. The want list is long, complicated, and expensive. The need list is pretty basic: food, water, clothes, and shelter. The crowds following Jesus had the same problem. They sought after Jesus – not because they saw him as the Bread of Life – but because they wanted more bread. To the crowds, Jesus is nothing more than a magic genie with a vending machine for a lamp. At the feeding of the 5000 the crowds ate all they wanted and were satisfied. There were leftovers. 12 baskets. And still they wanted more. They were hungry and yet incapable of satisfying their appetites. They followed Jesus unaware that he is who they needed. They wanted daily bread, but they needed something more: Jesus the Bread of Life. We’re no different. Jesus is the Bread of Life we need. Like Old Testament Israel, we grumble in spite of his gift of daily bread. Like the crowds following Jesus, we do not lack bread – God gave that to them freely. No we lack faith in him who is the bread of life – who gives himself for the life of the world. We foolishly think we can find contentment in the things we want rather than the one thing that is most needful: Jesus our Bread of Life. Thou hast made us for Thyself, O Lord, and our hearts are restless until they finds their rest in Thee. Like the crowds we are needy. We long for contentment but are incapable of finding it. Our spiritual appetites are starving, O Lord, until we find our satisfaction in Jesus our Bread of Life. And what does our Lord do, turn us away? Cry out: “no food for you.”? No. Jesus has compassion. Jesus had the crowds sit down, rest, eat, and listen to him. Jesus has compassion on you. Jesus would have us sit down and stop worrying, stop scheming, stop being so anxious… and simply rest and receive his promises. Jesus knows our greatest need and gives himself for you. His perfect life lived for you. His dying and rising for you. His own flesh and blood for your forgiveness. 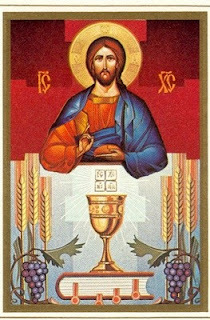 Jesus is the Bread of Life that does not perish. Jesus is the Bread of Life who gives you eternal life. This is why Jesus was anointed - not to be a new Moses; not simply to feed with earthly bread – though he does do that (food, water, shelter, clothing, and more). And above all, Jesus lives, dies, and rises to feed and satisfy our greatest need. And this is how the crowds responded. That’s how we sinners think: God gives a gift and we to make it all about us. How easily we twist God’s gifts into our own work. But Jesus sets us all straight. It’s not about you; it’s about Jesus for you. The work of God is that you receive him. It is the work of God that you believe in Jesus, trust in his provision for all our needs of body and soul. It is the work of God that you have faith in his Son, our Lord, Jesus. Jesus is the Bread of Life we need. And Jesus is the Bread of Life God gives to you. So today we join the crowds in receiving Jesus our Bread of Life. Where we are faithless, Jesus is faithful. Where we hunger and thirst, Jesus feeds us with his own body and blood. Where we are concerned about our daily needs, Jesus provides. For we come as beggars and yet Jesus feeds and clothes us. We are pilgrims who receive sustenance on the journey home. We are his sheep, and Jesus is our Shepherd. We are sinners who are forgiven. Jesus gives you his own flesh and blood as a forgiving food and drink. Jesus clothes you in his cross and new creation in Holy Baptism. Jesus shelters you in his own body, the Church. In Jesus you have everything you need.